This is a handsome bush, from three to six feet high, with pretty, almost smooth, bright green leaves, with large stipules. The flowers are sweet-smelling, about half an inch across, with cream-white petals, and form very beautiful and conspicuous rounded clusters, about three inches across, the long stamens giving a very feathery appearance. At a distance this shrub has the effect of Hawthorn in the landscape. It grows on mountainsides in rich soil. 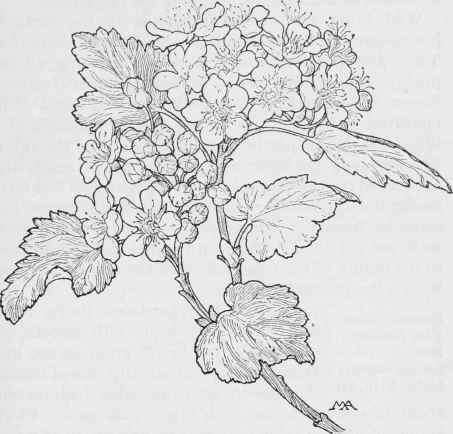 Ninebark- Opulaster malvaceus. ROSE FAMILY. Rosaceae.